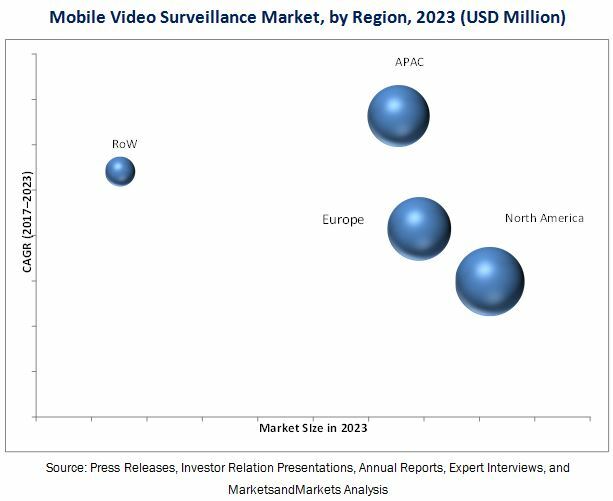 [181 Pages Report] The mobile video surveillance market was valued at USD 1.28 Billion in 2016 and is expected to reach USD 2.32 Billion by 2023, at a CAGR of 8.77% between 2017 and 2023. The base year considered for the study is 2016, and the forecast period is between 2017 and 2023. This report provides a detailed analysis of the mobile video surveillance based on offering, application, vertical, and geography. 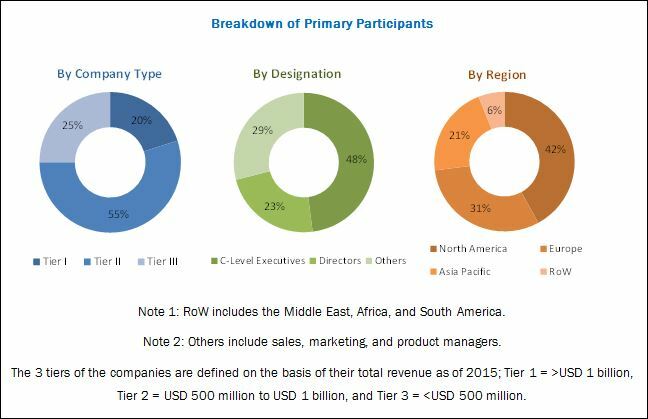 The report forecasts the market size, in terms of value, for various segments with regard to 4 main regions North America, Europe, Asia Pacific (APAC), and RoW. It strategically profiles the key players and comprehensively analyzes their rankings and core competencies in the said market, along with the detailed competitive landscape for the market leaders. The research methodology used to estimate and forecast the mobile video surveillance market begins with capturing data on key vendor revenues through secondary research. The secondary sources include IFSEC Electronic Security Association and Security Magazine, among others. Vendor offerings have also been taken into consideration to determine the market segmentation. The bottom-up procedure has been employed to arrive at the overall size of the global mobile video surveillance market from the revenue of key players in the market. After arriving at the overall market size, the total market has been split into several segments and subsegments, which have been verified through primary research by conducting extensive interviews with people holding key positions in the industry such as CEOs, VPs, directors, and executives. The data triangulation and market breakdown procedures have been employed to complete the overall market engineering process and arrive at the exact statistics for all segments and subsegments. The breakdown of the profiles of primary respondents has been depicted in the below figure. The mobile video surveillance market comprises raw material vendors, component and hardware providers, software providers, product manufacturers, distributors, and end users. The players operating in the mobile video surveillance market include Axis Communications (Sweden), Bosch Security Systems (Germany), Dahua (China), Hikvision (China), FLIR (U.S.), Avigilon (Canada), Pelco (U.S.), and Hanwha Techwin (Samsung Techwin) (South Korea). The mobile video surveillance market was valued at 1.40 Billion in 2017 and is expected to reach USD 2.32 Billion by 2023, at a CAGR of 8.77% between 2017 and 2023. The increasing concerns for public safety and security, growing adoption of IP cameras owing to a better functionality at a reduced cost, rising demand for cloud-based mobile video surveillance solutions, rising demand for intelligent and scalable mobile video surveillance solutions, improve g infrastructure and deployment capabilities drive the mobile video surveillance market growth. Hardware offerings are expected to hold a major share of the mobile video surveillance market during the forecast period. The demand for cameras, monitors, and storage solutions is high because these are the core components required in a surveillance system. The use of hardware components for transportation, city surveillance, and industrial applications has a significant contribution to the growth of the mobile video surveillance market for hardware offerings. The mobile video surveillance market for drones is expected to grow at the highest CAGR during the forecast period. Drones can be easily deployed and integrated into command, control, communications, computers, intelligence, surveillance, and reconnaissance systems. They have simple operational and maintenance procedures with high tactical capabilities. They are versatile and can carry out a variety of missions such as mountain search and rescue, illegal traffic monitoring, support to ground forces, and intelligence missions, among others. The transportation vertical is expected to hold the largest market share during the forecast period. With the rise in crime, harassment, liability suits, vandalism- and terrorism-related threats, need for providing surveillance for the general transportation system has increased. Sea and inland ports are important transit points for international goods trading. Huge container ships lay anchor, discharge their consignments, and go out for new cargos. Mobile video surveillance systems can be distributed across the port for monitoring all activities. APAC is expected to be the fastest-growing market for mobile video surveillance between 2017 and 2023. It has been found that China, Japan, Australia, and New Zealand contribute significantly to the mobile video surveillance market in APAC. The continuously rising demand for mobile video surveillance systems in the transportation vertical is one of the market growth driving factors. Factors such as increasing terrorist and crime activities, increased government spending on security equipment and initiatives to implement security cameras in public places help to drive the mobile video surveillance market growth in APAC. Privacy issues regarding data usage is the restraining factor for the growth of the video surveillance market. The key strategy adopted by major players in the market includes product launches. This strategy accounted for 85% of the overall strategies adopted by the market players between 2014 and 2017. Companies such as Axis Communications (Sweden), Bosch Security Systems (Germany), and Hikvision (China) have adopted this strategy to expand their customer base and enhance their product portfolio.